This topic contains 0 replies, has 1 voice, and was last updated by Robin C 5 years ago. No need of laser keyboard that you have seen in some upcoming iPhone concept videos. This simple and free App “Paper Keyboard” lets you learn faster typing with word games, chat with your friends, send emails and more. Check out the video below and you will be amazed with this all new innovative way of typing just on a printed paper. To answer how this paper keyboard works ? the phone’s camera detects your fingers with state of the art algorithms and lets you type on a paper that has keyboard layout printed. As the keyboard on paper has special characters as well, you can write java, sql and other codes as well. 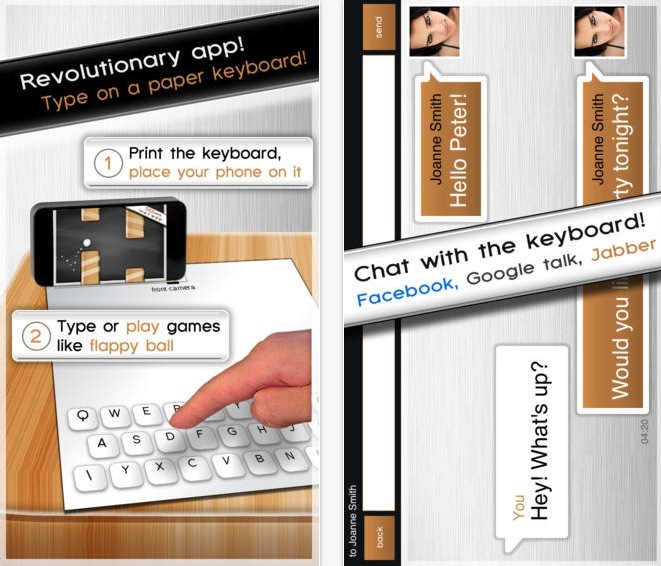 Paper Keyboard App is one geeky idea of making an A4 paper as a comfortable keyboard to use comfortably to type using your iOS device. Thanks for reading and share this post with your friends and followers across facebook, Twitter and Google+. Have a wonderful day.